I don’t even know where to start with this. Maybe with the reason I even picked up Ready Player One? I’d heard of it maybe a couple of years ago when everybody started reading it, mentally noted it as something to pick up one day if I happened across it and then forgot all about it. I was reminded every now and then when I saw it on the occasional list of favourites but it was never something I felt like I had to go out and buy. Until Hanna texted me in January at nearly midnight on a Sunday with much upper case enthusiasm and said that I HAD TO READ READY PLAYER ONE. So I did. Because I am nothing if not easily led by Hanna into reading pretty much anything. I was promised that it would be amazing. And it is. Absolutely, unrelentingly, unputdownably amazing. Reading it was the most fun I’ve had reading a book in years and I didn’t ever want it to stop. It manages to be both completely niche in its unashamed geekiness but also completely accessible. I was born in the late 80s (ok, fine, 1986 is probably “mid-80s” but whatever) so I’m really more au fait with 90s popular culture and missed a few of the computer game references but I knew enough about the music and films of the time that I could still feel connected. Even if I hadn’t got those references, I honestly believe that I would still have loved it because Cline just writes with such an obvious love for all things “nerdy” that it’s infectious. The text is quite small and there’s a lot on a page so when I opened it on the 10th of January, I thought it would maybe take a couple of weeks. I finished it on the 12th. I was travelling quite a lot in that couple of days, sure, but I was obsessed with it. And not in a general “oh, this is a good book” way. The kind of all-encompassing obsession with a book that means that you eat reading it, read it when you’re stood waiting for anything that will take any longer than 2 minutes and just generally ignore everybody else in your life until you’ve finished and can look to them for consolation over the gaping hole the book has left. Ready Player One may well be an homage to 80s pop culture but it’s also a gripping science fiction adventure story that’s grounded just well enough in reality that it doesn’t take long to lose yourself in. I don’t read a lot of science fiction because I don’t like reading long descriptions of technological advance or political background or, heaven forbid, actual science. Cline has managed to write something that is both undeniably science fiction but without the tedium. Somehow, you completely understand both the real and virtual world that Wade lives in without having to suffer through any dry explanations. It’s impeccable and not really all that much of a stretch of imagination. I remember when Second Life was launched about 10 years ago and the media was filled with tales of women leaving their husbands for men they’d met while building their perfect life. You don’t have to read the news for too long to see endless stories about bankruptcy, environmental disaster and how badly we’re damaging the world. Is it really that much of a stretch to imagine a world where everybody is crowded into small spaces without any money or natural resources, seeking refuge online? Add in an adventure story and you’ve got something golden. The online contest and the bedlam that ensues when Wade happens across the first clue is so, so much fun. Like everything else about this book. The pace is pretty hectic but not so much that it seem rushed or overwhelming. When I could feel that the story was starting to wrap up, I was genuinely sad. I could still be reading about Wade and about his friends two months later and I’m pretty sure I’d still be happy. The story is amazing. The characters are amazing. The writing is amazing. The whole damn thing from start to finish is AMAZING. Consider this your midnight text. 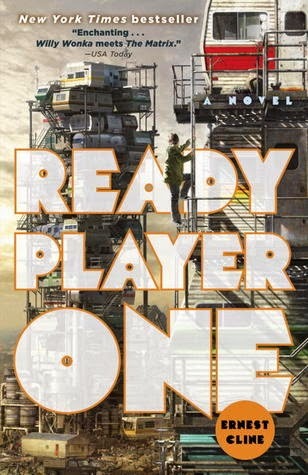 Overall: My biggest problem with Ready Player One is that finishing it and knowing that I’d read one of the best books I was going to read all year. Nothing since has even been close to being as good. Just read it, already. Ernest Cline’s next book, Armada is out on the 16th of July this year and I’ll be reading it as soon as I physically can (you can pre-order too HERE). I never pre-order books but there’s no way I can do anything but pre-order this. If it’s as good as Ready Plater One, I’ve got myself a new favourite author.